This treatise was afterwards translated into French, Dutch, and Latin. The Latin version was made by several hands. One edition was all or most translated by Mr. | Thomas Gilbert, of Edmund Hall, in Oxford, and printed at Amsterdam 1677, in 8vo; part of the Latin translation is inserted in the second part of the fourth volume of Pool’s “Synopsis Criticorum.” Our author’s treatise was attacked by Mr. Lambert Morehouse, minister of Prestwood, near Kilmington, who asserts, that 25 is not the true, but propinque root of 666. Mr. Potter wrote a Reply to him. Mr. Morehouse gave a manuscript copy of this dispute to Dr. Seth Ward, bishop of Sarum, in 1668. Our author, while he was very young, had a good talent at drawing and painting, and the founder’s picture in the hall of Trinity college is of his copying. He had likewise an excellent genius for mechanics, and made several inventions for raising of water, and water-engines; which being communicated to the Royal Society, about the time of its first establishment, were highly approved of, and he was admitted a member of that society. 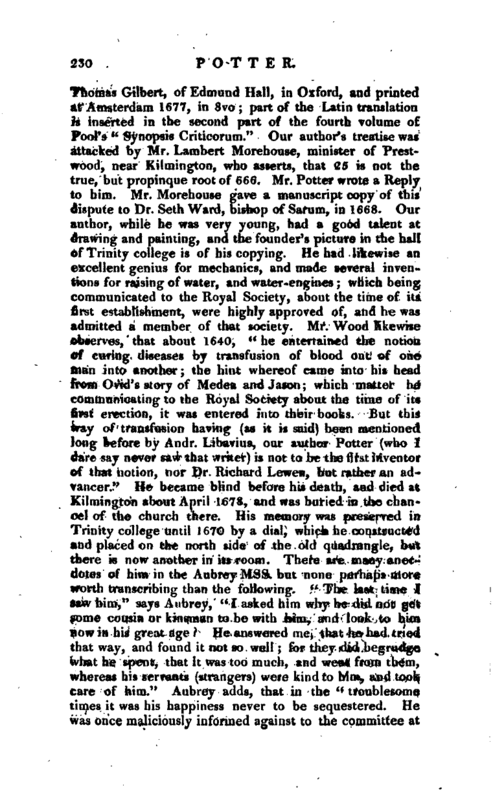 Mr. Wood likewise observes, that about 1640, “he entertained the notion of curing diseases by transfusion of blood out of one man into another; the hint whereof came into his head from Ovid’s story of Medea and Jason; which matter he communicating to the Royal Society about the time of its first erection, it was entered into their books. But this way of transfusion having (as it is said) been mentioned long before by Andr. Libavius, our author Potter (vfrho I dare say never saw that writer) is not to be the first inventor of that notion, nor Dr. Richard Lewen, but rather an advancer.” He became blind before his death, and died at Kilmington about April 1678, and was buried in the chancel of the church there. His memory was preserved in Trinity college until 1670 by a dial, which he constructed and placed on the north side of the old quadrangle, but there is now another in its room. 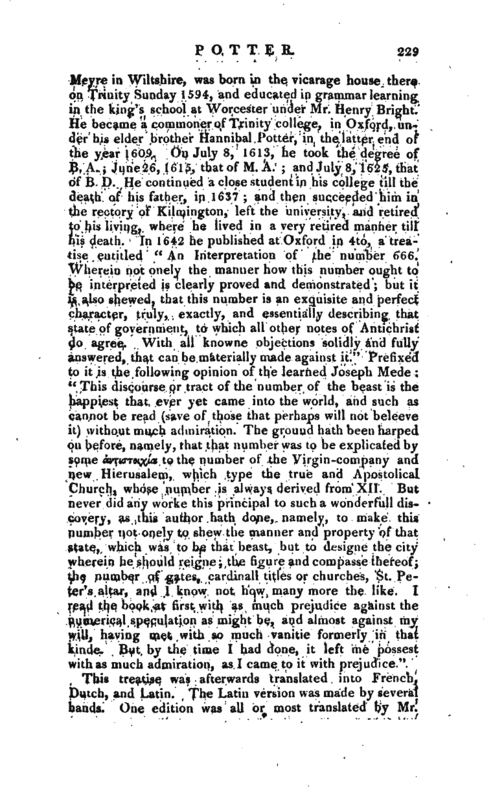 There are many anecdotes of him in the Aubrey Mss. but none perhaps more worth transcribing than the following. “The last time I saw him,” says Aubrey, “I asked him why he did not get some cousin or kinsman to be with him, and look to him now in his great age? He answered me, that he had tried that way, and found it not so well; for they did begrudge what he spent, that it was too much, and went from them, whereas his servants (strangers) were kind to him, and took care of him.” Aubrey adds, that in the “troublesome times it was his happiness never to be sequestered. 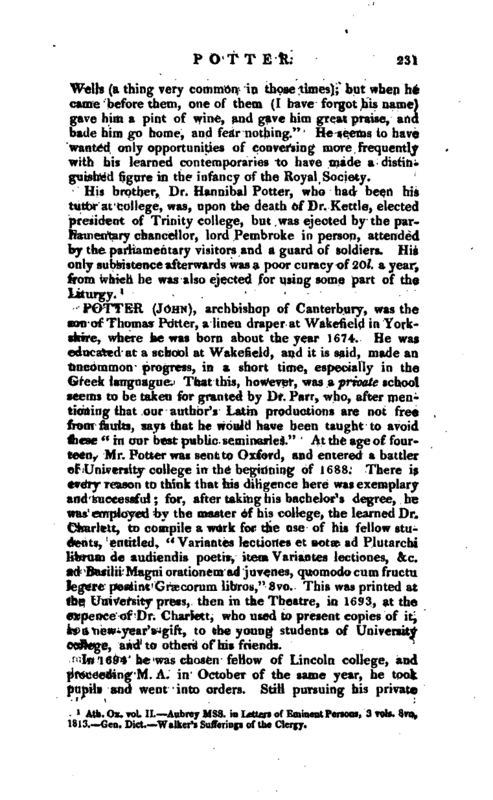 He was once maliciously informed against to the committee a* | Wells (a thing very common in those times); but when he came before them, one of them (I have forgot his name) gave him a pint of wine, and gave him great praise, and bade him go home, and fear nothing.” He seems to have wanted only opportunities of conversing more frequently with his learned contemporaries to have made a distinguished figure in the infancy of the Royal Society. Ath. Ox. vol. II. Aubrey Mss. in Letters of Eminent Persons, 3 vols. 8vo, 1813. Gtn. Dict. 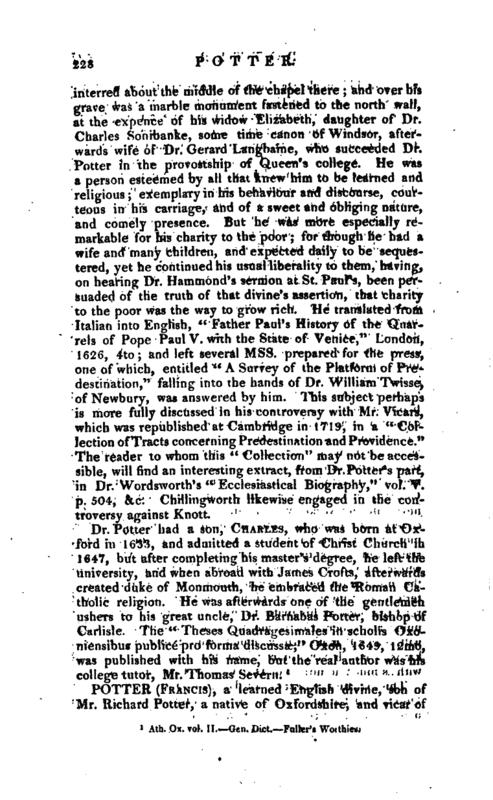 Walker’s Sufferings of the Clergy.